How a split-second stall in a top-secret chopper could lead to a new-and-improved Chinese stealth fighter and greatly alter the international arms race–in four easy steps. 1. Get to the chopper. On May 2, four helicopters carrying two-dozen U.S. Navy SEALs snuck into Pakistan bound for Abottabad, flying low to avoid detection by radar (that was switched off anyway). Leading the way were a pair of Sikorsky MH-60 Black Hawks modified for extra stealth, including radar-absorbent coatings on their skin and tail rotors with extra blades, dampening the noise. These and other features were borrowed, analysts would later speculate, from the RAH 66 Comanche–a stealth helicopter prototype canceled by the Pentagon in 2004. You know what happened next: The commandos landed inside Osama bin Laden’s compound before the occupants knew as occupants learned they were there. (Neighbors later reported they didn’t hear the choppers until they were on top of them.) But one of the Black Hawks lost lift upon take-off and clipped its tail on the wall of the compound. The SEALs blew it up before escaping, preventing the top-secret technology from falling into Pakistan’s hands. Or so they thought. 2. Show and tail. The tail survived, according to numerous photographs taken before the remains were hauled away. Last week, ABC News reported that China–Pakistan’s “all-weather friend“–was “very interested” in seeing the remains, according to anonymous officials. “We might let them take a look,” one said. Pakistan, ultimately, agreed to send the tail back to the U.S. But two weeks is a long time to photograph, videotape, and 3-D model the piece. [Update: American spy agencies have said it is likely that Pakistan allowed Chinese engineers to study the debris.] This small piece of wreckage could have a profound effect on the Asian-Pacific arms race, as it turns out. 3. Reverse engineer. Assuming the brightest minds of the People’s Liberation Army have time to pore over the wreckage, too, what will they find? “The most obvious thing they could analyze is the silver-loaded coating they used to absorb the infrared signature,” says Trefor Moss, an independent defense analyst. “I’m sure the Chinese would like to analyze that. And the shape of the aircraft, which is useful for learning noise-reduction techniques.” But it’s unlikely to yield more than that. “It’s not even a piece of the puzzle–it’s a snapshot of a piece of the puzzle,” says Richard Aboulafia, an aviation analyst at the Teal Group. “Stealth is a broad combination of design traits, as well as the ability to manufacture a system that combines them.” China currently lacks that ability, but can it reverse-engineer those traits from the wreckage? China’s used a crash to its advantage once before. Following the first test flight of its J-20 stealth fighter prototype in January, Croatia’s former military chief of staff Admiral Davor Domazet-Loso revealed that Chinese agents had obtained some of the wreckage of the F-117 Nighthawk stealth fighter which crashed, largely intact, after being shot down by Serbian missiles during the Kosovo War in 1999. “We believe the Chinese used those materials to gain an insight into secret stealth technologies … and to reverse-engineer them,” he told the Associated Press. Did some of those technologies make their way into the J-20? Possibly, although analysts agree the design of the J-20 appears to borrow more from fifth-generation stealth fighters such as the F-22 Raptor or the F-35 Joint Strike Fighter than the 1980s-era F-117. To that end, any snippets of current U.S. stealth technology gleaned from the tail rotor may prove to be a boon for China’s stealth capabilities. 4. Change the game. Even the suggestion that China has gotten the smallest leg up on its neighbors in its ongoing campaign to modernize its military is likely to further escalate the arms race. The amount spent on weapons purchases in Southeast Asia practically doubled between 2005 and 2009, according to the Stockholm International Peace Research Institute, while China’s official military budget quadrupled between 1999 and 2009. The result is that nations like India and Japan are lining up to build and buy fighter jets of their own. India made diplomatic waves last month when Boeing and Lockheed failed to make the shortlist for a $10 billion fighter order. (Only Eurofighter and Dassault made the cut.) U.S. ambassador Timothy Roemer resigned immediately afterward, ostensibly for personal reasons, but the WikiLeaks cables demonstrate how politicized arms sales can be, when even President Obama can be asked to make a sales call (as he did on his visit to New Delhi last fall). Pakistan, where the wreckage of that stealth Sikorsky has been held for the past two weeks, doesn’t seem ultimately willing to choose China over the United States, which has bequeathed it $11 billion in mostly military aid over the past decade. But that doesn’t mean it didn’t use that time to further ingratiate itself with China, potentially for first dibs on whatever China is ultimately able to produce from the wreckage. “The closest thing China has to an alliance is its relationship with Pakistan,” says Andrew Scobell, a senior political scientist at RAND. The pair are already collaborating on a new fighter jet, the JF-17 Thunder, and China is building a deepwater port at Gwadar as a base for its blue-water navy someday. 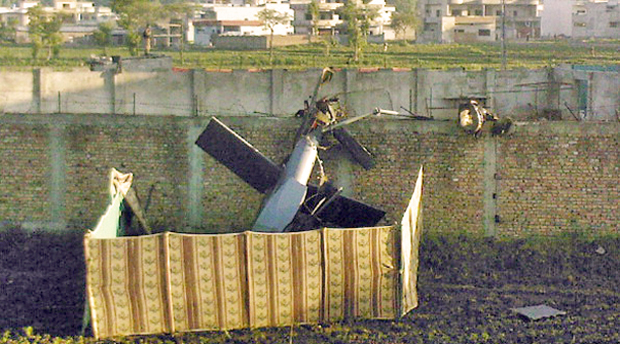 The fallout from the Osama bin Laden mission–including America’s strained ties with Pakistan, the latter’s stronger ties with China, and the helicopter wreckage raising the stakes another notch–could ripple across the region for decades. And paranoia can be good for business.